England’s new defence coach believes they are good enough to win next year’s tournament in Japan. John Mitchell puts Dylan Hartley through his paces. ENGLAND DEFENCE COACH John Mitchell recognises that New Zealand set the benchmark in international rugby but is confident Eddie Jones’ men can dethrone the All Blacks at the World Cup. Last week, Mitchell accepted the role that was left vacant by Paul Gustard’s decision to take the top job at Harlequins. 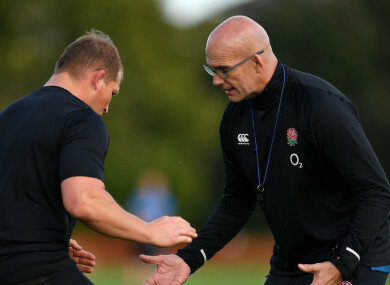 The New Zealander previously worked on the England coaching team for Clive Woodward, while he has been an All Blacks head coach and enjoyed spells at Wasps and Sale Sharks. Steve Hansen’s men remain the dominant force in rugby and enter next year’s World Cup in Japan as two-time defending champions, although South Africa proved the fearsome All Blacks can be beaten with a thrilling 36-34 Rugby Championship victory in Wellington earlier this month. Mitchell believes that loss will only make New Zealand stronger, but he sees no reason why England — who face off against Hansen’s side in November — cannot close the gap. “I really believe that we can get better and be the best within a year’s time,” he told the British media. “I really do believe that. I believe I can play a part in that and contribute to that. “They’re a very outstanding group and they’ve evolved the game as well. But this is a World Cup year and a World Cup does close the gap for some reason. “It’s knockout rugby and you just need to focus on being a better team yourself. That’s what we’ve got to do. “We can’t focus on them even though we get an opportunity to prepare and play against them, but focus on ourselves. “They set the benchmark and send out the signal to all of us, ‘you come and get us’. The Boks hung in there extremely well in Wellington and got what they wanted, but that’ll probably make the All Blacks even better and that makes our challenge even more exciting. Mitchell also addressed those who have previously portrayed him as an abrasive character. “It’s funny the perception you create and I sometimes laugh at the perception. For some reason that’s the perception and some people see that as the reality, and it’s not,” he added. Email “New Zealand the benchmark but England can win World Cup - Mitchell”. Feedback on “New Zealand the benchmark but England can win World Cup - Mitchell”.